Almost 120 miles from the salty waters of the Caribbean Sea, sharks patrol Lake Nicaragua. Here, the fresh water provides no sanctuary for swimming animals; this shark’s comfort in fresh water is unusual among their kin. Long thought to be endemic, it was not until 1961 that scientists demonstrated that the Lake Nicaragua shark was not a valid species, and these sharks were members of a wide-ranging species. While Lake Nicaragua is only 12 miles from the Pacific Ocean at some points, it does not connect to it. The only navigable route to salt water is via the San Juan River, which is passable for small boats with drafts of less than 3 feet. Covering almost 4,500 square miles, Lake Nicaragua is a relatively shallow body of water, with an average depth of about 40 feet. The lake is noteworthy for hosting many species that typically inhabit marine environments. The sharks inhabiting Lake Nicaragua are bull sharks (Charcharinus leucus). Bull sharks are medium to large sharks that can reach more than 11 feet in length. Though scientists quickly noticed similarities between these sharks and bull sharks, they lake was thought to be effectively landlocked, making the Lake Nicaragua shark had likely differentiated into a separate species. However, in 1976, Thomas B. Thorson of the University of Nebraska-Lincoln, tagged sharks swimming in Lake Nicaragua. Finding sharks that were tagged in Lake Nicaragua swimming in the Caribbean, effectively demonstrated that the sharks were able to travel the nearly 120-mile journey up the San Juan River. This proved that the sharks in Lake Nicaragua were not a unique species. Well known for their ability to tolerate fresh water, scientists have observed bull sharks swimming over 2,600 miles upstream in the Amazon River. The habitat preferences of bull sharks vary with their age, and populations from different geographic regions adapt to their habitats differently. 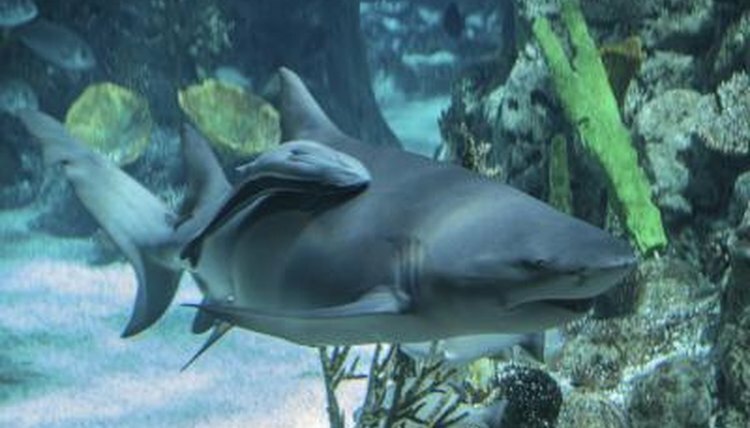 In general, young bull sharks are born in coastal waterways and estuaries. They spend their youths in these shallow and relatively predator-free environments before moving into the more open habitats that their parents frequent. As a species, bull sharks are remarkably adaptable, and are able to thrive in a variety of habitats. The concentration of salt in water has drastic effects on an organism living in it. If the water outside of a shark is saltier than the water inside the shark -- as is the case for those living in the ocean -- the shark’s internal water will have a tendency to be drawn from the shark. Conversely, if a shark’s internal water is saltier than fresh water, it causes the shark’s body to absorb more fresh water. Bull sharks cope with this by lowering the osmolality -- salt concentration -- of their blood and by urinating very often when inhabiting fresh water. These physiological changes are energetically expensive, which potentially explains why juveniles do not often inhabit fresh water, as they have not yet built up the energy reserves to offset the losses incurred.